Beer and pizza are two of my favorite things. After a full day attending the Social Cities of Tomorrow conference in Amsterdam, I took a leisurely walk back to my hotel through the Jordaan district of the city. I was lucky to find the ‘t Arendsnest beer bar which serves “Dutch beer only!” from seemingly most of the beer brewers in The Netherlands (although I did not notice any Heineken there?). 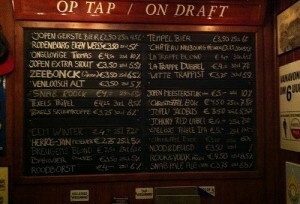 They have 30 or so beers on tap and over 100 in bottles including a selection of Dutch abbey beers. 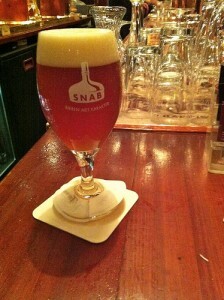 I didn’t realize that The Netherlands also had abby breweries (they are not all in Belgium). I tasted two pilsner type beers and an India Pale Ale, all three were draft. All three were really good, very hoppy and clean tasting. They have a beer sampler for 7.50 Euros for three 12cl tastes, but I ordered normal size 25cl glasses and wound up paying 10 Euros with tip. Both bar tenders were fluent in English and happy to guide me to the right beers. They have some ‘bar food’ and many of the locals shared cheese plates, but the food did not seem to be the main point here! They also have tastings and things so it would be worth checking he website to learn if something interesting is going on when you visit. After my beer I remembered walking by what looked like a great pizza place the day before: it had a wood burning oven, only served pizza and advertised “Italian slow food”. So I decided to try and find it again. 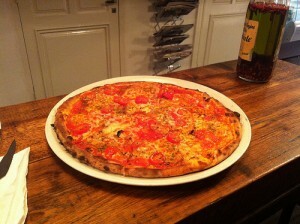 I retraced my steps, found the right canal (Prinsengracht), turned down the Elandsgracht (Jordaan Park), left on 1ste Looiersdwarsstraat walked to number 4 and Pazzi was open with room at the bench they have for people who want to eat their pizza in the shop. I ordered a Margarita, the pizza I use to compare pizzerias, and sat down to wait. 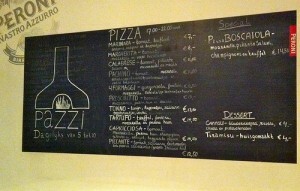 About 3 minutes later I was served a great pizza: crisp thin crust, tart sauce, good amount of buffalo milk mozzarella cheese. By this time I was sharing the bench with a couple women who were splitting a quatro formaggio (served here with rucola) and two guys on my right who had both ordered Piccante pizzas. Apparently the Piccante pizzas were not spicy enough for the guys and they asked me to pass the hot pepper olive oil (that’s when I asked them what kind of pizza they had since it was not entirely clear by looking). So, a fabulous gourmet evening for me in Amsterdam! All my photos from ‘t Arendsnest and Pazzi on Flickr. My Amsterdam photos on Flickr.